The pressure gauge is one of those critical components most take for granted. Equipment operators must have accurate pressure readings to ensure safe operation of the equipment and to perform the tasks required. 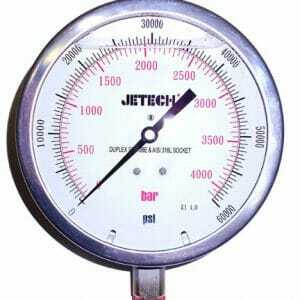 Jetech stocks Ultra High pressure gauges for quick delivery. Call us today and ensure that your equipment is performing at the pressures required. An accurate and reliable gauge is essential to high-pressure jetting and cleaning. Obtaining and maintaining the correct pressure for your specific high-pressure water application is needed for efficiency and elimination of surface damages. JETECH is a distributor of high quality analog and digital gauges for use on high-pressure water jetting equipment.